Severe storms have disrupted the long-distance swimmer's progress, but Lecomte is as determined as ever to forge ahead with his historic trans-Pacific journey. B	B	ecoming the first man to swim across the Pacific Ocean from Tokyo to San Francisco was never going to be easy. Over the past two months of this perilous campaign for ocean conservation and science, Ben Lecomte and the crew aboard Seeker have faced rough seas, seasickness, nausea, and a constant stream of plastic. The 51-year-old swimmer has still doggedly progressed more than 500 miles, pushing forward eight hours daily against a parade of hurdles. Now two typhoons, Jongdari and Wukong, have interrupted his momentum and forced the ship to head back to port in Japan — a development that reflects the difficulty of the journey and the unpredictability of the ocean. Tropical storm Jongdari had already created hazardous swimming conditions along Japan’s eastern coastal waters when it became a hurricane-strength typhoon as it approached Japan this weekend, hitting the island nation with winds of up to 110 mph and cutting off electricity to more than 158,000 households. At least 24 people have been reported injured. Wukong has meanwhile been churning the ocean northeast of Japan. Putting his frustrations into perspective while maintaining a rock-solid mindset has become a routine exercise for Lecomte. He accepts that the weather is beyond his control, and he remains focused only on factors that he can influence. Maks Romeijin, the crew’s medic, said that Ben isn’t a person that succumbs to mishaps. “He’s physically and mentally ready for the challenge, no matter what stands in his way,” he said. Lecomte set off on this treacherous 5,500-mile voyage across the Pacific on June 5. 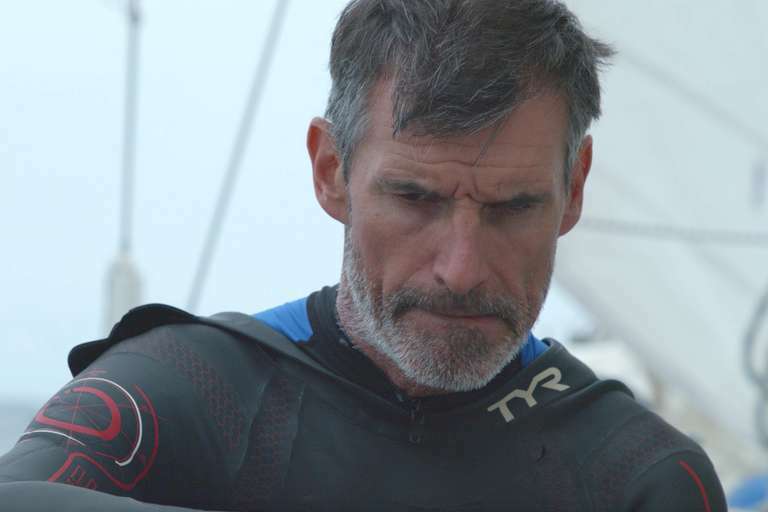 The aim of his six-month-long swim is to raise awareness about the state of world’s oceans. Along the way, Lecomte and his crew will collect data and conduct experiments that will help researchers better understand conditions in the Pacific, including the Great Pacific Garbage Patch. The garbage patch is an area of plastic pollution in the Pacific gyre system that spans more than 600,000 square miles. The gyre’s vortex has collected a diffuse stew of plastics that has grown to become the largest of several offshore plastic accumulation zones around the world. The waste ranges in size from tiny microplastics that are less than 5-millimeters long to larger objects like bottles, crates, and fishing nets. A recent study estimates that this region could hold upwards of 80,000 tons of ocean plastic. But plastic isn’t confined to the garbage patch. Pollution has spiraled into a crisis threatening the world’s ocean ecosystems, and The Swim team has seen distressing evidence of this in the water every day. Spending hours in the water daily, Lecomte has been up close and personal with the impact that pollution is having on sea life. Traversing Earth’s largest body of water takes energy, and Lecomte consumes 8,000 calories a day in order to fuel his grueling swimming routine. Ben plunges into the ocean at around 8:00 am each day. During his time in the water, he eats only soup and bread that is prepared at 4:00 am by Yoav Nevo, who is also the boat’s skipper. The adventure also takes courage and resilience. Bouts of motion sickness and dropping into the cold waters of the Pacific each day test not only Lecomte's physical abilities, but also his mental endurance. Although he is swimming along the Kuroshio Current, which flows northward from the west side of the North Pacific, he’s had to endure unfavorable swimming conditions throughout his expedition. As if fighting the forces of the world’s fiercest ocean isn’t enough, the path along which Lecomte is swimming is also a major international shipping channel. Fourteen days into the swim, a large tanker came precariously close to Ben while he was in the water. The crew contacted the ship, offering GPS coordinates in order to avoid a mishap. Lecomte is an experienced long-distance swimmer. In 1998, he swam across the Atlantic Ocean from Massachusetts to France, with a one-week stopover in the Azores. Like his current swim, which aims to raise awareness about ocean conservation issues, his Atlantic effort also had a social purpose: to raise awareness about cancer following the death of his father. In the water, swimming among the ocean’s wide array of species, Lecomte reflected on the majesty of the Pacific ecosystem.